The government will meet on June 19 to decide the communes for which a state of catastrophe naturelle will be declared following the storms that have battered the country in recent weeks. Interior Minister Gérard Collomb said the first half of 2018 had been "catastrophique" in terms of weather-related natural disasters as he announced the date of the first meeting to discuss the latest natural disaster to hit the country. Following floods in January, catastrophes naturelle were declared in hundreds of towns, paving the way for thousands home owners to file insurance claims under specific rules. Read more: Am I insured for natural disasters? The news came as it was revealed that the storms and floods had claimed two more victims. A 37-year-old man was found drowned in his car in northern France, while a woman in her 90s suffered a heart-attack while mopping up floodwater in her home in central-western France. More storms were due in the eastern quarter of the country on Thursday afternoon and evening, but only the Eure was on orange alert for flooding in Météo-France's morning bulletin. 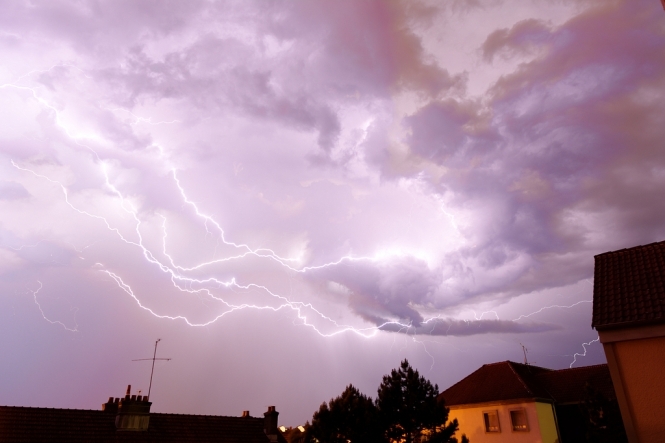 After a record-breaking May for lightning strikes, Keraunos - the French observatory for violent storms and tornadoes recorded 15,200 lightning strikes between 12midnight and 6am on Wednesday - with the Doubs, Seine-et-Marne and Nièvre worst affected.